Destination Jungle in June 2015 launched the new initiative "The Chimpanzee Go!" under Bugoma Forest Conservation Campaign, to raise support and interest for the chimpanzees and the protection of Bugoma Forest in Uganda. This campaign comes following “Run for Nature 2014”, the sport event which was organized in September 2014 with the objective to start a project of tree-planting and reforestation of degraded areas of Bugoma Central Forest Reseve. Since Run for Nature, 5 acres of forest were identified and replanted in collaboration with the National Forestry Authority. Bugoma Central Forest Reserve is a very important and large forest of the Albertine Rift Valley ecosystem, hosting an endangered population of chimpanzees; however Bugoma does not enjoy the attention it deserves in terms of resources for its protection and in terms of investments, including eco-tourism, which could help the conservation. During this period, we met the groups of Collaborative Forest Management, based on the communities surrounding Bugoma Forest and who should collaborate with the forest authorities in the protection of the forest and to identify good practices so that the pressure over resources is reduced. Particularly, we had an important meeting on 21st March 2015 in the occasion of the "International Day of Forests 2015", at Nsosi forest station (National Forestry Authority), when we discussed and agreed about the importance of supporting more tree-planting projects. We also talked about the need to respect the chimpanzees who are inhabitants of the tropical forest. For this reason, we decided to launch “The Chimpanzee Go!”. This is a fundraising initiative open to the international public. The campaign will run between 2015 and 2016, with the first phase ending in December 2015 to make first assessments and contributions. 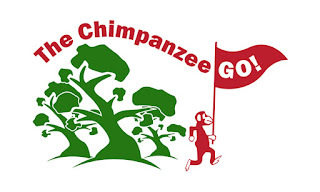 The logo of “The Chimpanzee Go!” is a chimpanzee running near a forest while holding a red flag with the word “Go!”, which symbolizes the expansion of the habitat of the chimpanzees contrary to the current trend of reduction of that habitat. The “chimpanzee go!” is a message of hope for the chimpanzees. 1) First of all, to continue to invest in the tree-planting exercise and restoration of degraded areas of Bugoma forest, following the activities already started by the proceeds of Run for Nature 2014. 2) Secondly, to raise funds for law enforcement. One of the major factors of destruction of Bugoma is illegal cutting of trees for timber. It is urgent to intervene by giving a signal to those operating illegal logging that the rule of law is restored. The project will give support in monitoring the forest and helping the law enforcement mechanisms. Much was achieved in the last two years, many people were arrested, but we should not lower our efforts. 3) The third objective is to give incentives to local private owners and farmers, so that they can maintain a forest cover in their land, in the areas surrounding Bugoma Forest and to expand forest cover through tree-planting. Considering that in the buffer zones there are many cases of human – wildlife conflicts and that there are sensitive areas where the presence of the wildlife and the chimpanzees is ancestral, we should target those sensitive areas as the priority. Therefore, our project is looking at giving support to those private farmers organized in the Collaborative Forest Management Groups to maintain and to expand their forested land, in order to reduce the pressure against the environment. When we look at the species of trees to be planted, we only look at indigenous, typical species of the tropical forest already present in Bugoma and with the purpose of conservation. We target for this campaign all friends of Bugoma Forest Conservation Campaign, all the people who feels concerned for the future of forests and the chimpanzees in particular, and those friends and tourists travelling through Destination Jungle. We are going to offer specially made t-shirts which will be available for all 2015. This is the year of the “The Chimpanzee go!”.